THE BLOOD TIES on the CU campus this year run surprisingly deep. You already knew about our football team’s heralded father/son combo at coach and quarterback. You probably even knew that a pairing of uncle and nephew each scored touchdowns in the season opener against CSU. Did you know, however, that the Koelbel family has its third generation—and counting—on campus this year? Walt (BS ’47 Marketing) & Gene Koelbel (BS ’47 Marketing) have a granddaughter who is a CU-Boulder undergrad and a grandson in Leeds’ MBA program. Portfolio cornered the Koelbels’ second generation (Walter A. “Buz” Koelbel, BS ’74 Finance) to find out why family trees like his take root at Leeds. Portfolio: The football team has family ties at coach/QB and receiver/tailback—and now a third generation of Koelbels graces the business school. 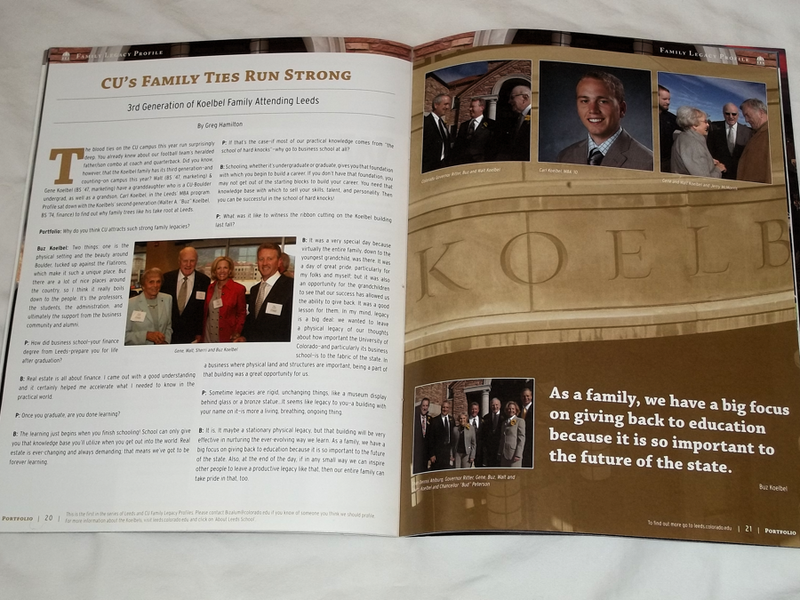 Why do you think CU attracts such strong family legacies? Buz Koelbel: Two things: one is the physical setting and the beauty around Boulder, tucked up against the Flatirons, which make it such a unique place. But there are a lot of nice places around the country, so I think it really boils down to the people. It’s the professors, the students, the administration, and ultimately the support from the business community and alumni. P: Did business school—your finance degree from CU—prepare you for life after graduation? B: Real estate is all about finance. I came out with a good understanding and it certainly helped me accelerate what I needed to know in the practical world. P: Once you graduate, are you done learning? B: The learning just begins when you finish schooling! School can only give you that knowledge base you’ll utilize when you get out into the world. Real estate is ever-changing and always demanding; that means we’ve got to be forever learning. P: If that’s the case—if most of our practical knowledge comes from “the school of hard knocks”—why go to business school at all? B: Schooling, whether it’s undergraduate or graduate, gives you that foundation with which you begin to build a career. If you don’t have that foundation, you may not get out of the starting blocks to build your career. You need that knowledge base with which to sell your skills, talent, and personality… Then you can be successful in the school of hard knocks! P: But aren’t there some people out there who make it big in business without a formal background? B: It’s not to say that you can’t find success the other way, I just think it gives you that foundation and a jump-start that is necessary in this competitive world. P: A few years back, Koelbel & Company purchased some land near Winter Park that had some personal significance to your family, specifically the old Ski Idlewild resort where you had grown up skiing with your family. How important is it to keep a personal touch like that in business? B: Business is personal and it’s emotional. Our family had a 60-year history up in Grand County, having been one of the places where I learned how to ski. Part of that emotion was there when we made that deal: going back to a place where we had fond childhood memories. But if the intrinsic long-term business opportunities weren’t there, honestly that personal side wouldn’t matter as much. P: It wouldn’t be business if there weren’t practical, profitable motives as well. Is it possible in a profit-driven world to make space for ecological, sustainable decisions as well? B: Absolutely. Real estate development starts with a philosophical foundation… One of ours is: “Under all lies the land.” We try to balance the economics with doing the right thing for the right reasons. What we’ve learned over time—and I learned this from my dad—is that by focusing more on doing the right thing, the economics will be there in the end. P: What was it like to witness the ribbon cutting on the Koelbel building last fall? B: It was a very special day because virtually the entire family, down to the youngest grandchild, was there. It was a day of great pride, particularly for my folks and myself; but it was also an opportunity for the grandchildren to see that our success has allowed us the ability to give back. It was a good lesson for them. 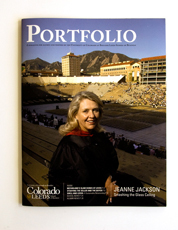 In my mind, legacy is a big deal: we wanted to leave a physical legacy of our thoughts about how important the University of Colorado—and particularly its business school—is to the fabric of the state. In a business where physical land and structures are important, being a part of that building was a great opportunity for us. P: Sometimes legacies are rigid, unchanging things, like a museum display behind glass or a bronze statue… It seems like legacy to you—say, a building with your name on it—is more a living, breathing, ongoing thing. B: It is. It may be a stationary physical legacy, but that building will be very effective in nurturing the ever-evolving way we learn. As a family, we have a big focus on giving back to education because it is so important to the future of the state. Also, at the end of the day, if in any small way we can inspire other people to leave a productive legacy like that, then our entire family can take pride in that, too.